On a Saturday in mid-March, I walked 2.6 miles and 42 blocks down Irving Street to Beachside Cafe, and I was hungry. My hunger grew the longer I walked, and along with it, hungry indecision. In my mind, I could see a pastry, the perfect, tender, sweet, and comforting pastry that would solve my craving, but I couldn’t quite make out what it was. Was it a cookie, a scone, a cinnamon bun or twist? It was impossible to tell. There was almost no line as I walked into Beachside, and a full display of pastries glowed in the light of hunger and baked good glory. This was the first level of disaster. 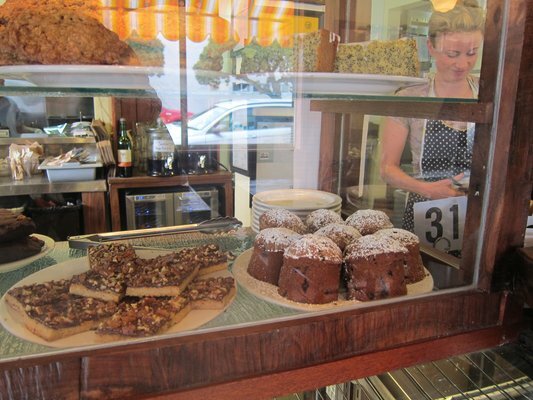 When faced with a display of pastries in which everything looked good, my mind froze up solid. I was left staring open-mouthed at the pastry display like the first Adam trying to name a billion different orange-colored things. I began to ask the server a series of questions, becoming more dissatisfied with every answer. These were the questions of a woman who clearly had no idea how to satisfy her need for a pastry or even what that particular need was. The crux of the issue is that I knew there was a right answer – there was a pastry on the shelf that would satisfy my deepest desires and yearnings, but I didn’t know how to find it, and I was terrified of missing the chance to sample the perfect pastry. At last I chose the peanut butter cookie, and it was tasty – probably one of the better PB cookies I’ve had, but it didn’t hit the spot, the spot that cannot be named. It’s not the chocolate, pie, or berry spot. It is the pastry spot, and it is left un-hit, a hole in my soul that still seeks to be satisfied. The quest continues. Who will win? The spot, or the human? If you liked this, you might also like Experimentation in Pastries at Craftsmen and Wolves, Purchasing and Eating a Sandwich, and Deconstructed Peanut Butter and Jelly Sandwich. I’ve had this problem. Turns out that once I’ve given up and decided I don’t know what I want, I figure it out by going home and looking in my freezer. Ice cream seems to hit my spot if not just fill as a substitute for the time being. ice cream is often a good substitute for many things. See if San Fran has any Gooey Butter Cakes. That might do the job! St. Louis, goodie–tried and true. Oh wow…that sounds pretty delightful. Y’know, I often go through this, then end up walking right by, without buying anything – how weird is that? Yours, avoiding disappointment. Sometimes that’s the best option for everyone involved. I read once that when you are having a food craving that you can’t find fulfillment for, it’s actually not food that you are craving, but an emotional need. Em, if you have any questions about what you should choose as a life’s vocation, this post might hold a hint. You sound like every chef I’ve worked with who was developing a dish. The main aim is to hit that ephemeral spot that satisfies. You seem to have that spot built in. You search cafes for that elusive breakfast, pastry or ambiance. You’ve got the writing chops. You’ve got the eye for detail. You can put it into words. You walk a lot. This all points to freelance food critic, guidebook author to the clueless or tour guide. Oh. the walking part, if you sample you have to burn it off. True story: I’ve often thought about becoming a tour guide. Stay tuned. There’s something called hiphost that I might try out one of these days.